Sound View Electronics manufactures automated messaging systems for escalators and moving walkways. Our automatic messaging systems are frequently used in the following applications: Subway, Train and Bus Stations, Arenas, Hotels, Amusement Parks, Stores & Shopping Malls, Casinos and Airports. If you need an automated messaging system for an application not listed above, we will be happy to work with you to fulfill your specific requirements. Our automated messaging systems for escalators have six different speaker options, four amplification designs to fit your unique situation and four types of messages. 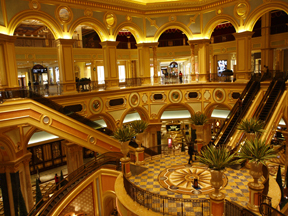 When it comes to escalator modernization or escalator safety, Sound View Electronics announcement systems can bring your escalators to their full potential delivering automated safety, directional, instructional and advertising messages. Our escalator announcement systems are the only ones approved for use in the NYC Subway System. Under the streets of NYC, our systems have to take extreme abuse and constantly deliver easy to understand messages. If we can handle their demands we are confident we can meet and exceed your needs. 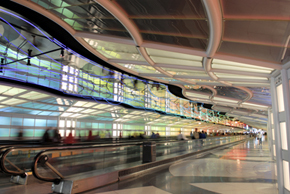 Our moving walkway automatic messaging systems help keep riders safer, keep the traffic flowing by delivering instructions and directions and can even deliver advertising messaging. Our speakers and amplifiers are vandal, shock, water and vibration resistant. The most popular moving walkway announcement system that we sell uses our glass mounted speakers. These are attractive speakers that attach to the sides of the glass panel and provide clear communication that can be used for announcements for most any purpose. They can also be configured to display any of eight colors or to blend discretely into the sides of the walkways.